The Rebate Edge Door incorporates an overlapping edge and PVC seal to all four edges of the door. The PVC seal provides noise suppression and good protection from moisture and dust, making this door ideal for exposed weather conditions. 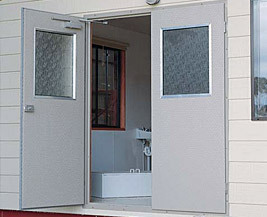 A Rebate Edge Door is manufactured in pre-painted Colorbond steel and also available in optional Diamond Embossed. The Diamond Embossed finish provides a unique look and extra strength to the door surface. Timber blocks are fitted internally to accept the required locking and hardware. An optional exterior marine grade plywood core can be used to give added strength. Although generally used in an open out application, open in doors are available with a modified bottom seal. Transportable buildings for mining and construction industries, lunch rooms, communication rooms, site accommodation and applications with high exposure to a harsh environment. The Rebate Edge Door standard surface finish is pre painted Colorbond steel and is also available in optional Diamond Embossed surface. The standard material is pre-painted Colorbond steel. Also available in Zincalume, Galvabond, aluminium or stainless steel. Powdercoat finish is not available to Rebate Edge Doors. Other Sizes up to 2400mm high x 1095mm wide x 40mm available. Exterior marine grade plywood also available. Pre-fitted heavy duty steel hinges with nylon bushes. 40mm Standard Rebate Edge Door – 20.00kgs. Frames can be customised to suit specific applications. For transportable buildings use flange fit and for Architectural applications use a BW Style frame to suit the required wall thickness. 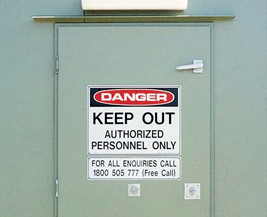 Door shall be a Lietzke Rebate Edge Door comprising a solid polystyrene (or exterior grade marine ply)* core sheeted with pre-painted Colorbond (or diamond embossed)* Colorbond steel with an overlapping trim and PVC seal pre-hung in a Lietzke Metal Door Frame. The door units can be pre-fitted with the locks and hardware as specified.